Learning another language can be a very beneficial and important skill as students grow into young adults. 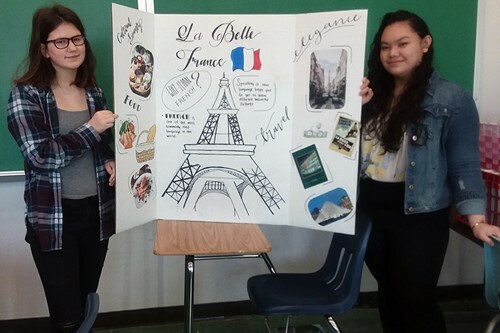 To that end, The UE Foreign Language department held its second World Language Night on March 13 at JFS. District Italian, French, and Spanish teachers (along with dozens of student helpers) presented games, songs, art projects, salsa dancing lessons, photo booths and food. In the cafeteria, families were treated to cuisine from the three cultures; pasta, sauce, meatballs, and salad from Sons of Italy with fresh bread donated from Roma’s Bakery; salsa, queso and chips from Moe’s; and desserts donated from Alexander’s Restaurant. This event was created to generate interest and knowledge of the three foreign languages taught in U-E.